The holidays are all about opportunity—the opportunity to break from quotidian routines and indulge way more than is appropriate. While turkeys and hams tend to monopolize our November and December feasts, one of the most magnificent meat centerpieces—the rib roast—is all-too-often forgotten. 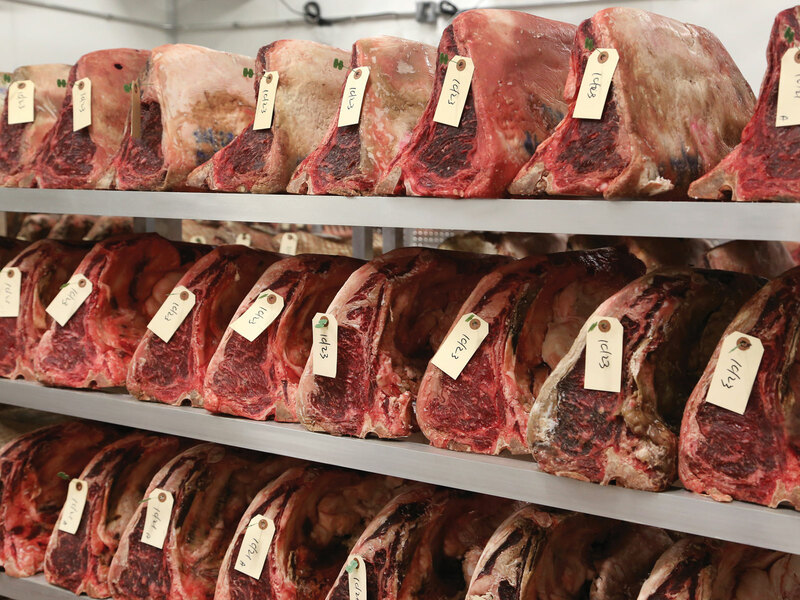 We chatted with Josh Tanner, chef and partner at New York Prime Beef, about pulling off a festive, if slightly over-the-top, rib roast that will impress just about everyone. 1. First of all: Treat yourself. "Do yourself a favor and invest in a nice cut of USDA Choice or Prime," says Tanner, who says that the consistent quality of graded beef is well worth the price. "If you prefer to buy a grass-fed cut, try out less expensive cuts from a few different suppliers. Flavor and texture differences between grass-fed beef producers can vary even more than in typical grain fed beef." 2. Opt for a super-flavorful dry rub. Here, Tanner suggests breaking with tradition. "While thyme and rosemary are classic, I enjoy adding some spice to my roast with a deeply flavorful and aromatic dry rub," he says. "I use the spices below in everything from BBQ ribs to frittatas for the kids, just varying the amounts to desired taste and intensity: sea salt, smoked paprika, ancho powder, garlic powder, thyme, black pepper and raw cane sugar (to enhance browning and add depth of flavor.)" And don't skimp on the seasoning. "Whatever your rub or seasoning of preference is, don’t be shy with it," he says. "You’re not just seasoning the outside of the roast, but the entire five pounds or more of meat you’re putting in the oven." Don't throw out the fat drippings! They make veggie side dishes even tastier. "If you spent the money on a nicely marbled USDA Prime piece of meat, treat the fat drippings with respect," Tanner says. "Baby carrots, brussels sprouts and potatoes take on a lustrous sheen and a newfound richness when finished in a hot skillet of beef roast renderings." 4. Buy a remote probe thermometer. "Put it in your roast, put your roast in the ove and relax," he says. "A remote probe is one of the best investments a home cook can make for $20." 5. Let your meat rest after (and before!) cooking. "We are always reminding people to let their meat rest after cooking and before serving, but with larger cuts 16 oz. and up), removing the meat from your refrigerator and allowing it to come up in temperature is just as important," Tanner says. "By letting the meat become more uniform in temperature throughout, this simple step shortens cooking time and helps achieve a more consistent color and texture within the meat rather than a scorched exterior and undercooked interior. For a large roast two to three hours should suffice." For more rib roast inspiration, here are seven showstopping recipes hand-picked by F&W editors. Master the art of the holiday roast with the helpful tips below. Rubbed with fragrant McCormick seasonings and slow-cooked to tender perfection, both of these recipes are worth the leg work: Herbed Beef Rib Roast and Peppered Herb Rib Roast.